There are many buzzwords thrown around in the digital government universe, but the most impactful ideas are rooted in one action: engagement. Whether it is a tweet, a mobile app, or a community of practitioners, every digital program or service requires interaction between an organization and its customer. Engagement is also the foundation of all user experience initiatives and is this year’s theme for World Usability Day. 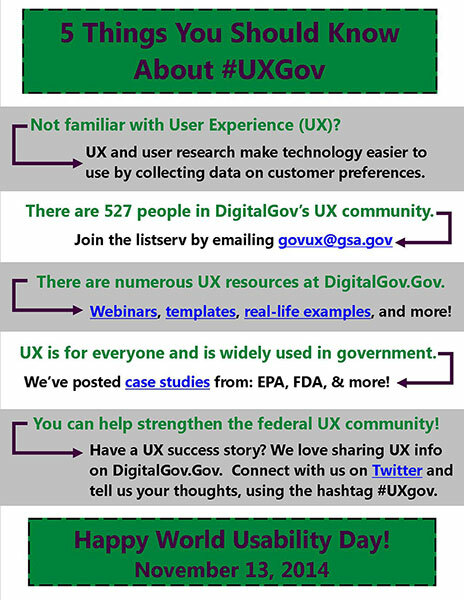 In light of today’s global celebration of UX, the DigitalGov team is highlighting five important facts about UX work that is done in the U.S. federal government. Remember—whatever you build, it always come down, ultimately, to the customers that use it. Make sure they are part of the process, and they’ll thank you for it.